These notes are for the course which has closed on September 18, 2017 for major re-development. Anticipated re-opening March 2019. Wide fairway for the start of your round. Best to position the drive slightly left of centre to allow an easier second. The second shot needs to be hit between the large trees avoiding the dam on the left and the trees on the right. This will present a short iron shot to the green which is guarded on the right by bunker and on the left by a grass mound. Ladies: Straight is good. Tree lined fairway. Avoid the trees and rough on the right for the second shot. There is a dam on the left at about 100m out. At the green there is a bunker on the right and grassy mound on the left. The shortest par 3 is guarded by a dam on the right which covers the front half of the green and there are two raised bunkers on the left. Do not be long or you will face a difficult chip with the green sloping away from you towards the dam. Ladies: A deceptive par 3 with any shot not perfectly hit likely to find the water in front. Bunkers left and significant slope off the green at the back. This is the hardest hole on the course and deserves its number 1 rating. It is flanked by out of bounds all the way on the right, and a creek on the left, which crosses the fairway diagonally starting at the bridge, about 265 metres from the tee. Best to position the drive left of centre to give better angle for the second shot. The green is guarded by mounds on the right which can kick balls out of bounds. Also do not be long as the green drops away leaving a difficult chip. Ladies: A difficult par 4 rated number 1. Only the big hitters contemplate going over the diagonal hazard for 2. Out of bounds on the right, trees and hazard on the left. The green is guarded by mounds on the right which can kick balls out of bounds. Also, do not be long as the green drops away leaving a difficult chip. A short par 4 to a small raised green which slopes from back to the front. The fairway narrows at 240 metres between two grass mounds and long hitters may prefer a 3wood from the tee. A birdie chance but if you miss this green anywhere but short and in front you will left with a very difficult chip to get up and down for a par. Ladies: A good drive to the centre of the fairway will set up the second shot. Any shot right for the second will encounter rough, a small bush and big gum. There are trees on the left too. The small raised green slopes from back to the front and there are slopes off each side of the green and more severely at the back. A straight hole to a back to front sloping green, guarded by a bunker on the left hand side. A good drive with a short iron in for the second, but again don’t be long or you will be left with a difficult chip. Ladies: A straight par 4 with fairway mounding and a bunker left of the green. Anything right off the fairway near the green will require a low shot under tree branches. Don’t be long. The longest par 5, this hole doglegs right. It is guarded by out of bounds all the way to the green on the right hand side. A drive down the centre will set up an easy 3 wood second shot to leave a short pitch to the smallest green on the course. A creek crosses the hole 190 metres from the green and short hitters might find it difficult to carry, especially if playing into the prevailing westerly winds. Ladies: A long par 5 with dogleg right. A good drive towards the left side of the large gum will allow an easy layup, or a shot over the hazard for the bigger hitters. The creek crossing the fairway needs to be avoided or extra shots will be accumulated. No hazards around the green but Out Of Bounds runs right of the hole from tee to green, and strategic mounds shape the fairway. This hole is a dogleg to the left. It is a difficult driving hole with a creek running right to left diagonally away from you across the fairway, and a large leaning tree blocking the right side. A straight drive just to the left of this tree will leave a short to mid iron, but too far left and you will be blocked out by a large gum. 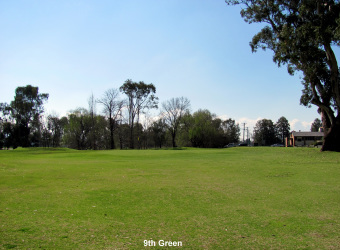 The green is guarded by a raised bunker on the right and a dam on the left hand side that extends around to the back of the green. Ladies: To locate the tee go over the bridge and turn hard right to bring you to the best tee shot on the course. It requires a straight shot through trees. Anything left will have the next shot to the green blocked by a large gum. Any tee shot right is likely to hit closer gums. A good drive will leave a short iron to the green. Bunker right and a dam on the left near the green. A straight forward par 3 to the largest green on the course. The only hazard is a raised bunker on the right hand side. Do not be long or you could face a difficult chip if the flag is at the back of the green. Ladies: A long par 3 to one of the larger greens on the course. A raised bunker is on the right of the green. A short par 4 and some of the long hitters attempt to drive the green wind assisted. The more sensible approach is to take a long iron or rescue from the tee to avoid the creek that runs right to left diagonally away from you across the fairway. This leaves a second shot with a short iron to a long narrow green. Ladies: A challenging par 4 requiring a good tee shot to position for a shot over the diagonal hazard. Higher handicap players would be wise to lay up for their second shot. The green is long and narrow with slopes off the left and a section of the right, making it a difficult target to hit. Beware of the Out Of Bounds on the right over the creek. The shortest par 5 and a real birdie opportunity. A good drive down the left hand side will open up the slight dogleg right to give you a chance to reach the green in two shots. You will need to avoid the dam on the left and the trees on the right. The green is guarded on the right by bunker and on the left by a grass mound. Ladies: The longest par 5 on the course with Out of Bounds on the right. Aim for the centre from the tee, and then stay left to avoid trees and rough on the right. Any shot from the right of the fairway to the green will be affected by overhanging branches requiring a low shot. There is a dam on the left at 100m out and a greenside bunker right. This is the course signature hole and requires a precision shot over two trees and the dam that covers the front of the green. You must also avoid the two raised bunkers on the left of the green. Do not be long or you will face a difficult chip with the green sloping away from you towards the dam. Ladies: A difficult par 3 as the dam just short of the green needs to be carried. Higher handicap players should look at the gap short and left and use their shots wisely with a chip and 1 or 2 putts a likely strategy. There are two raised bunkers on the left of the green. The creek that runs left to right diagonally away from you across the fairway can be reached by the long hitters so a 3 wood or rescue should be taken from the tee. This will leave a short to mid iron to the green. Ladies: A short par 5 but a calculated lay-up second shot for most players is required. This can be a par hole with the third shot over the diagonal hazard played from 110- 120 metres out. Over the back of the green is not the place to be as it slopes away. A short hole which plays as a dogleg to the right. Long hitters can attempt to cut the corner, but if they miss to the right they could be blocked by two tall gums. If you miss this green make sure it is short and in front or you could have a very difficult chip. Ladies: A different line to the first time around. Hit left to avoid the trees and rough, and have a better approach to the green. Short is best on this green. A long par 4 which requires a straight tee shot between two large gums, which sets up a mid to long iron shot to the green. Remember don’t be long or to far left or right or you will have difficulty making par. Ladies: A shorter par 4 but fairway mounding, and a bunker on the left of the green, need to be negotiated in making par. Green slopes off the back. A dogleg to the right with out of bounds all the way on the right hand side. Reachable in two for the long hitters if the prevailing westerly is not blowing. The drive needs to be aimed just left of the large tree on the right. For most players two shots down the centre will leave a short iron to a small green. Ladies: A tough par 5 with the tee shot closer to the Out Of Bounds on the right this time round. The drive needs to be aimed left of the large tree on the right. Bigger hitters can carry the hazard with their second shot but a good score is 6 on this hole. This hole is a birdie opportunity. It is a dogleg to the left and a long tee shot with a draw past the large gum on the left will set up and easy pitch to the green. Alternately a 3 wood or rescue to the centre of the fairway leaves a short iron shot. Ladies: A short par 4. The tee shot is played over the hazard just in front of the tee. A good drive on this hole and a solid iron can set up a birdie opportunity. Any tee shot hit left towards the big gum or right to the treeline, will hinder this plan. A long and difficult par 3 often played into the westerly wind. This hole has managed to bring a number of good rounds to a grinding halt. Ladies: A short par 3 to a large green which can be soft in front. A bunker on the right will any catch stray shots. The last needs to be played in a similar way to the 9th. A local rule of thumb is to hit the same club from the tee as you did on the 17th which should leave a short iron to the green. A number of longer hitters have been brought undone by attempting to drive the green and have ended up out of bounds or in the water hazard. Ladies: As for the 9th except the tree line on the left needs to be avoided. The diagonal hazard needs to be crossed. Rated number 2, this hole deserves respect.